BEIRUT - Al Qaeda fighters killed the leader of a rival Islamic brigade in a twin car bombing near Syria's northern city of Aleppo, an attack likely to further exacerbate rebel infighting in the country's brutal civil war even as government forces continued their intense shelling of opposition-held areas of the city on Sunday. 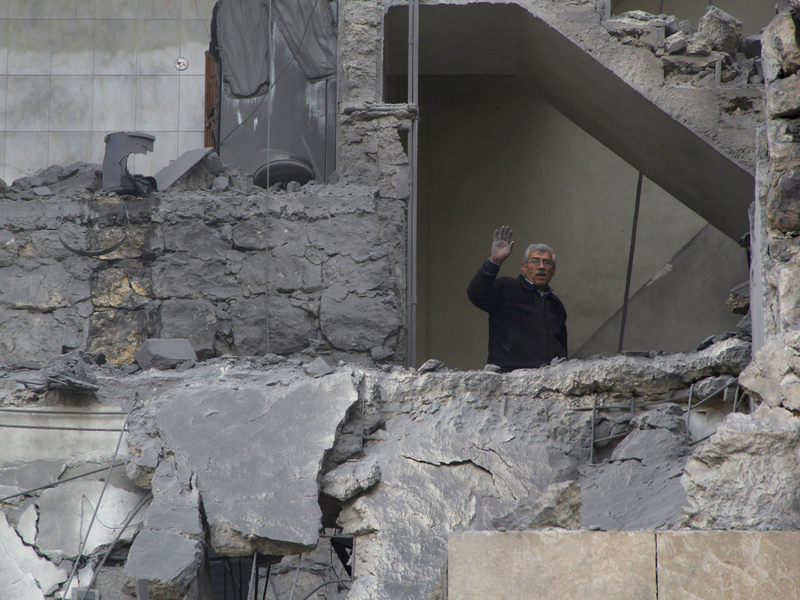 Syrian aircraft bombed buildings, burying people underneath rubble in the Bab Neirab area, said the Aleppo Media Center. It wasn't immediately clear how many casualties there were. The bombings came after military aircraft dropped barrels packed with explosives over rebel-held areas on Saturday, killing dozens, including an attack that killed 34 people in the rebel-held neighborhood of al-Bab, said the Britain-based Syrian Observatory for Human Rights. The group collates the country's war death toll. Activists say the troops' advance has been mostly been propelled by military aircraft heavily bombing residential areas, smashing buildings into rubble, forcing civilians and rebels to flee. They've also been assisted by weeks of rebel infighting that has pitted a loose alliance of Syrian fighters against al Qaeda linked extremists of the Islamic State of the Iraq and the Levant. Fighting was likely to be exacerbated further after Islamic State fighters undertook a twin suicide bombing that killed 26 people on Saturday, including the military leader of a rebel group. The attack targeted the base of rivals, the Tawheed Brigades, and killed commander Adnan Bakkour, said Rami Abdurrahman of the Observatory. The al Qaeda linked Islamic State also killed another prominent commander of another rebel brigade, said analyst Charles Lister of the Brookings Doha Center. Lister said the extremists killed Abu Hussein al-Dik of the powerful Suqour al-Sham, showing that the Islamic State was targeting key headquarters, "strategic checkpoints and senior influential commanders." Syria's war, which began as a peaceful uprising in March 2011, has slowly spread to neighboring Lebanon in a myriad of ways. Late Saturday, a shadowy Lebanese extremist group claimed responsibility for a suicide car bombing in a Shiite town that killed at least three people, in an attack linked to the war in Syria. It is the third bombing that the Nusra Front in Lebanon claimed responsibility for in the country. A series of bombings have targeted Shiite Muslims in Lebanon as Hezbollah's participation in the Syrian war exacerbates sectarian tensions at home. Extremist Lebanese Sunni Muslims now view their Shiite brethren as legitimate targets because they support Hezbollah. The bombing occurred Saturday evening. The war has also become increasingly sectarian, with extremist groups blamed for attacks against Syria's many minority faiths. Also Sunday, a group that supports militants posted a video to social networks showing a Sunni fighter beheading another man as adults and children gathered to watch. In the video, adults cheer as the fighter cuts the other man's head off with a small knife. The beheaded man's hands are tied, and it isn't clear if he was alive while he was being beheaded. The men's accents and languages suggest the fighters are a mix of Russian-speakers, foreign Arabs and Syrians. Abdurrahman of the Observatory said Sunday that the video was likely filmed in the central Syrian province of Homs last week. Photos of the body and severed head were also posted to a separate Instagram account by a supporter of the al Qaeda linked Islamic State. The photograph showed another decapitated body nearby. The video underscores why many among Syria's Christian and Muslim minorities support Assad in the three-year uprising against his rule, fearing extremist militants will ultimately prevail should Assad fall.